The banned items are here only because they either have dupe glitches, cause lag or grief the spawns. Some of them are likely to be unbanned soon. It's a server for the people! We have friendly staff, and we don't care what you do as long as it doesn't break the few, very simple rules. We currently have two multiverse worlds open. One for everyone, and one for donators. We also have two more worlds that are on the way. One will be for mini-games, and the other will be decided by the players. 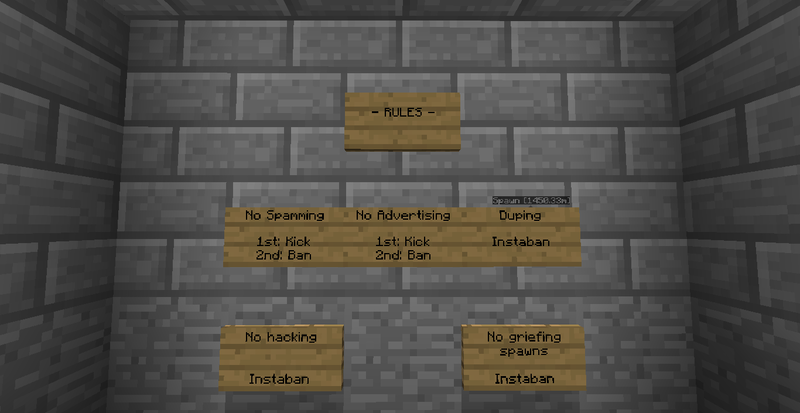 The server is 24/7 and the players and staff are all friendly. Seems to be a good server, I'd suggest banning force fields as they just arent mutliplayer nice generally.